Dan Hill Sculpture is a collaboration between my father, Utah sculptor Dan L. Hill, and myself, Dan C. Hill. We began Dan Hill Sculpture in 1995 when my father retired from his landscape maintenence business and I left a job with the U.S. Treasury Department in Washington, D.C. and moved back to Utah. We were both looking for something new to do when I told my Dad that if he started sculpting I would sell his work. 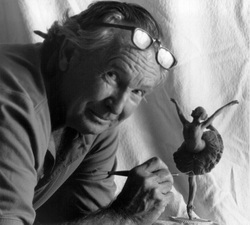 He thought I was crazy but he started sculpting anyway, and now, nearly two decades and 100 bronze sculptures later, he's still going strong. My Dad's talent for sulpting emerged accidentally in 1974 when he was lounging around at home recuperating from a work related foot injury. While watching an old western on television, he began messing around with a toothpick and some playdough my two sisters and I had been playing with. By the time the movie had ended Dad had sculpted a small bust , capturing a remarkable likeness of actor Lee Marvin. These humble beginnings as a sculptor were followed by the early success of two sports action sculpture commissions and a first place ribbon in the Professional Sculpture Division at the Utah State Fair. The demands of running his own landscape business and raising a family curtailed Dad's sculpting activity during the mid-1980s and early 1990s. During this time his creative talents were focused on designing and creating elaborate perennial gardens and other landscape features. He also discovered a talent for painting landscapes using acrylics and oils. Browsing the sculpture collections on our website demonstrate my Dad's swift progression as a sculptor as he embarked on his "second career." He has created an impressive body of work, winning his share of accolades along the way, including numerous public placements of his life-size pieces throughout the country. Dad's special talent for capturing likenesses keeps him busy fulfilling commission requests.